Once you’ve made the decision to transform your garage so it better suits your needs, you’re faced with a choice: Do it yourself or bring in a professional? There are advantages to doing it yourself. You have the satisfaction of a job well done (if you’ve avoided the pitfalls I spoke about in an earlier blog post), and it will likely be cheaper because you’re not paying for labour. However, when you’re installing an ‘out of the box’ system, you end up with something generic, but it’s unlikely they’ll fit perfectly. You’ll probably end up with some wasted space. We come in and build to the measurements of your garage, using the space from wall to wall. Everybody has different wants and needs, whether it’s storage, garage size, lighting requirements or aesthetics. A professional may be able to come up with options that you’re not aware of. For instance, several weeks ago I visited a client who had a one car garage that was too simply not wide enough to accommodate a car, but it was high and deep. I asked him if he had things he’d like to put in a garage. He told me he had Christmas decorations taking up space in the basement. We talked about building a shelf along the back wall for storage, which doubled the storage space available. He’d hadn’t considered anything other than floor space. I find that overhead storage is the most commonly overlooked area. The space is ideal for storing things you don’t need more than once a year such as holiday decorations or snow tires. For some clients, the way the garage looks is as important as the job it does, whether it’s keeping boxes and tires out of sight or incorporating more high-end finishes. The flooring is where customization can really shine. Your floor can be anything from standard grey tiles to something with a granite look. I come prepared with 6 to 8 samples of what’s available, but if a customer doesn’t like those, they can select colours from the Sherman Williams colour palate for a completely custom job. No one else offers that. 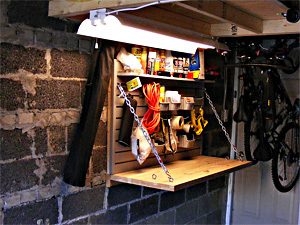 We look for the right eyeline, so what we install fits in with the rest of the garage. For instance, when we choose a spot to install slatwall and hooks, we may keep it level to a door. We also incorporate existing features such as light switches. It’s a finishing detail that makes the job more professional. For your shelving, we can give it either a rough or finished look. Lighting is also a consideration. You may be using your garage for more than just parking after the transformation, but a bare bulb may not be enough light. We can install pot lights under a platform or in front of cabinets. We can even position small spotlights if you’ve got sports cars you’d like to feature. Every customer we see and every garage we visit is unique. Nuvo Garage tailors the storage solution to maximize the space available, leaving you with a superior product and a garage that meets your specific needs.